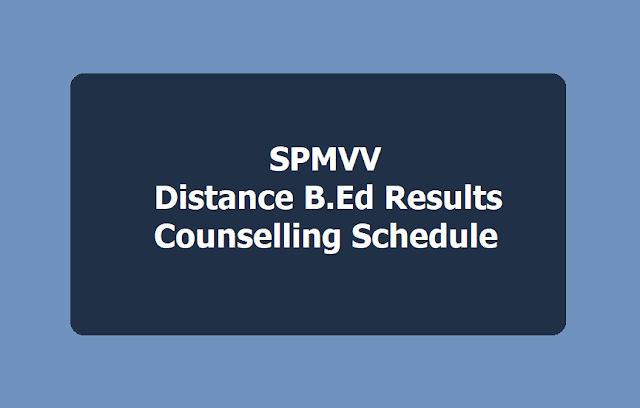 Sri Padmavati Mahila Visvavidyalayam B.Ed(D.M) Admissions counselling notification 2018, SPMVV Distance B.Ed Admissions counselling, Women's University Distance B.Ed Course Admissions counselling 2019, list of Documents for Certificates verification: Sri Padmavati Mahila Visvavidyalayam, Distance Education Centre, Tirupati issued B.Ed(D.M) Admission Notification 2018-2019 for admission into Distance Mode Bachelor of Education Course for working women teachers in Andhra Pradesh, based on the norms of NCTE, besides other courses. The SPMVV University invited applications from the eligible women teachers for admission into B.Ed(D.M) Course. 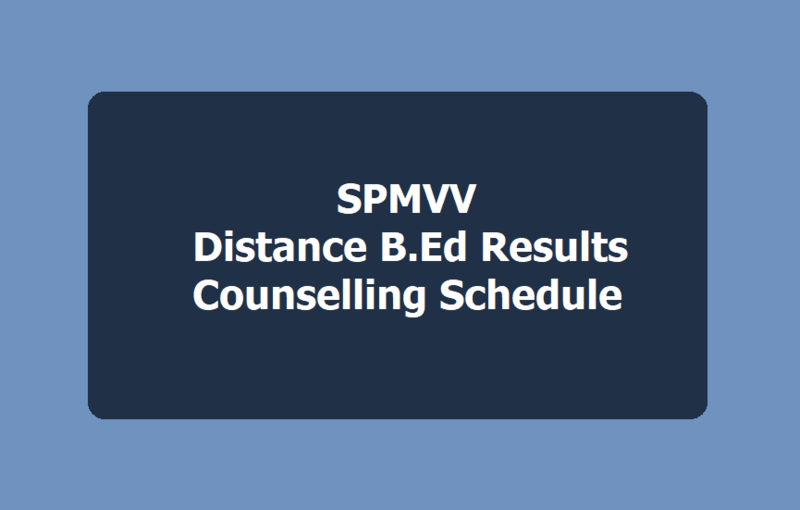 Now, Women's University has announced the results of Distance B.Ed and counselling schedule 2019. The list of selected candidates may attend the counseling along with the original certificates as per the schedule. B.Ed. (D.M) 2019 Admissions of Andhra Region: The Selected Candidates are required to attend Counselling at Smt. Addepalli Mahalakshmi Devi (SAMD) College of Education for Women, Danavaipeta, Rajahmundry, East Godavari District with all the originals and a set of xerox copies of the same as per the Distance B.Ed Counseling schedule. B.Ed. (D.M) 2019 Admissions of Rayalaseema Region: The Selected candidates are required to attend Counselling at Seminar Hall, Humanities Block, SPMVV, Tirupati with all the originals and a set of xerox copies of the same as per the Distance B.Ed Counselling schedule. 6. T.T.C./D.Ed. or NCTE recognized teacher education certificate and its marks lists. 7. Study Certificates from IX to Degree or from VI to Intermediate or for seven consecutive years or Residence Certificate issued by an appropriate authority. 9. Certificates in support of special category claims viz.PH/Sports/Games/NCC/NSS etc. Sri Padmavati Mahila Visvavidyalayam, Tirupati from a nationalized bank.